Some of our biggest rewards in renting Casa Campana as a vacation destination have come in the form of getting to know so many wonderful guest families and couples. In addition to interactions before and during their stays, it is a thrill reading the many handwritten guest book entries, and on-line reviews recalling their wonderful vacation experiences. 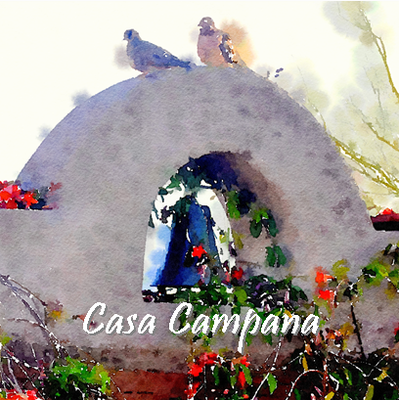 We are always grateful for the feedback on Casa Campana and learning what they enjoyed most about their Southern Arizona vacations. We have made many great memories at our Sonoran Desert home in a short time, and it is rewarding to know we have enabled others to do the same. One on-line review was particularly generous as well as thought provoking. It began by saying “ Casa Campana is the Ritz Carlton of vacation homes... ” We were of course very flattered by the comparison. For a vacation villa owner, feedback like this makes our year. Coincidentally, in addition to an impressive inventory of luxury properties all around the world, Ritz Carlton’s Dove Mountain Resort is just a few minutes from Casa Campana and was our brief home base during our Tucson house hunting trip several years ago. Unfortunately we didn’t see much resort time since we were out touring an exhausting list of over thirty homes. Interestingly, the property that was to become ‘Casa Campana’ was the first house we saw on the first day of house hunting. Due to its custom detailing and unique sense of privacy and tranquility, it was unmatched out of all the properties on the market. Even though we loved the house immediately, we soldiered onward eliminating the rest of the properties, sometimes with only so much as a quick ‘drive by’ needed to scratch it off the list. In spite of our house hunting priorities that weekend, we did enjoy every minute we were able to spend at “The Ritz”. When I read this, I was struck by the intense focus on the environment, service, and overall guest experience. Nowhere in ‘the mission’ does it mention typical corporate jargon like striving to be the market leader in the luxury resort sector, or other financial measures of success. It places the guest and the many intangible factors that make up a Ritz Carlton experience ahead of everything else. Wisely, Ritz Carlton management knows that if they deliver on this stated mission, then success will follow. Many other great ‘experience-oriented’ companies, such as Apple with their Apple Stores, have openly emulated Ritz Carlton’s customer service focus. We know from our own experience at Casa Campana, that it is an atmosphere that ‘ enlivens the senses ’ and ‘ instills a sense of well-being ’ (sound familiar?). It is the focus on these intangibles that is difficult to capture in a rental listing or even in photos. It’s what makes the difference between a perfectly fine vacation property and one that consistently delights guests and exceeds expectations. In a way we are stealing from Ritz Carlton’s playbook, just on a much different scale. In reality, we simply try to deliver a guest experience that is equal or better than our own expectations as guests. After vacationing in many wonderful luxury and boutique resorts in the U.S., Mexico, and Caribbean over the years, our approach with Casa Campana from the beginning has been to deliver an experience we would be impressed by if we were guests. Whether it is taking in mountain views from the lush courtyard over morning coffee with the trickling fountain and cooing doves in the background, or evenings spent by the outdoor fire under brilliant star-studded desert skies with coyotes chattering and nighthawks soaring overhead, Casa Campana provides an exceptional atmosphere. It is an ambiance that exudes relaxation. Combining this with unobtrusive attention to guests’ needs forms the basis for a unique vacation villa experience. While we appreciate the reviewer’s metaphor, we wouldn't go so far as to claim equivalence with Ritz Carlton. The playing fields are very different. But we do our best to provide an unbeatable vacation villa experience focusing attention on our guest’s comfort and on providing a beautiful environment and ambiance. Is it stealing, or really just like-mindedness? Continue to Part II to learn of a number of ways our guests are benefiting from our close proximity to ‘The Ritz’.